So tomorrow I'm selling the FoST and buying a E39 540i. I love the FoST but it just isn't what I need anymore. I've put almost 30,000 miles on it in the 13 months I've owned it and it's been great, but with my new job I don't need the storage space of the hatchback and since my daily commute is only 5 miles each way the reliability aspect of having a new car is also less important to me. Also I'm starting a banking job where I wear a suit everyday so a black executive BMW will stand out less than a bright tangerine hot hatchback. 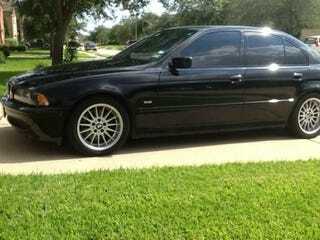 I'm really excited about the E39 though, it's a 2001 540i with the 6 speed manual, only 70,000 original miles and it's been adult owned the entire time. I test drove it yesterday and it was incredibly clean and a fantastic drive. I used to drive a E46 323i and I really regret selling it, I love BMWs of this era and I'm excited to get back into one. I've been reading up on the M62TUB44 V8 in this car and it sounds like if you take care of it then they can last a long time. I don't expect to be racking up miles the way I used to be so hopefully I won't have any reliability concerns. I think I might be assembling one of the most Jalop garages ever. E39, Karmann Ghia, Willys Jeep, Lemons car. I'm actually hoping with the purchase my vehicle turnover will slow down for a while, this will be the 12th different vehicle I've owned since the summer of 2013.